Our Interactive Strategy documents serve as a blueprint for your web implementation. 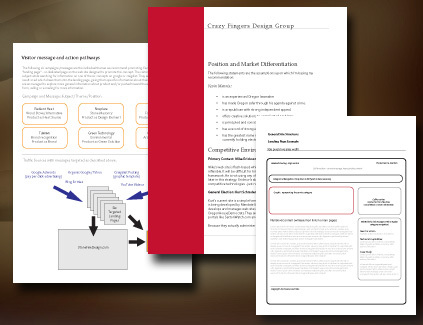 The document serves to outline goals and vision for management to evaluate design benchmarks - whether Crazy Fingers handles the implementation, or if you use in-house staff. We begin the process by facilitating a meeting with the company principals - the ones who are directly responsible for the firms destiny. We then evaluate competition, opportunities and risk factors. We recommend an online brand and position, wireframe content flow and promotional strategy, and leave you with a document with all our findings and recommendations.